A Sunday in God-Years takes its title from the notion that if we consider ourselves inside the long stretch of geologic time, human history happens in the blink of God’s eye as he rolls over during a Sunday nap. The book is centered around the long poem “A Reckoning” made up of fifteen shorter poems/sections (some sections are documents like wills and runaway slave notices). 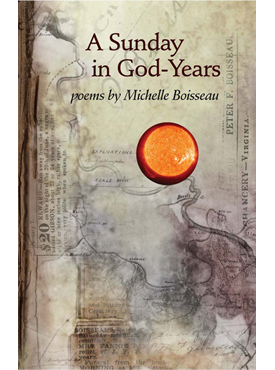 This long poem tries to reckon and recognize the sticky webs that bind the heirs of those who were slave holders (like the Boisseaus) and of those who were held as slaves. “A Reckoning” builds the context for the rest of the book which, among other things, looks through the metaphors from geology to confront the historic and personal: Boisseau’s paternal ancestors fled religious persecution in France in 1685 and soon after their arrival in Virginia became entangled in slave ownership. When one looks on human history through the lens of geologic time, when one shifts the scale from the now and near to the distant, and takes a sky-perch, like God, some fascinating things begins to happens. Looking down on us from a satellite, from a conjectural place in deeper spaces from which our cameras have never looked, or from a moment long before humans ventured from trees, human history is thrillingly diminished and immediate human compassion becomes essential as air. Michelle Boisseau is professor of English at the University of Missouri-Kansas City where she also serves as associate editor of BkMk Press. She is the author of three books of poetry, No Private Life; Understory, winner of the Samuel French Morse Prize; and Trembling Air, a PEN USA finalist. She is coauthor of the popular book Writing Poems, now in its seventh edition.